The amazing Slaty Bristlefront...and we saw it amazingly well! Photo by guide Marcelo Padua. This short tour is a dream come true for many birders, as there are few places where one can spend so many days without having to change lodges and yet have such a productive trip. Getting settled into a room and not having to pack a suitcase every couple of days is a big appeal, and so is the fact that this tour is packed with Atlantic Forest endemics, many of which are extremely rare; several can be seen right on the grounds of our lodge. I have to admit I was a little intimidated before leading this tour as John Rowlett had been guiding it for several years -- and so I especially wanted to make it a great one. Right off the bat we were faced with some unusually cold weather as an a typical cold front parked itself over Southeast Brazil for the entire duration of the tour! 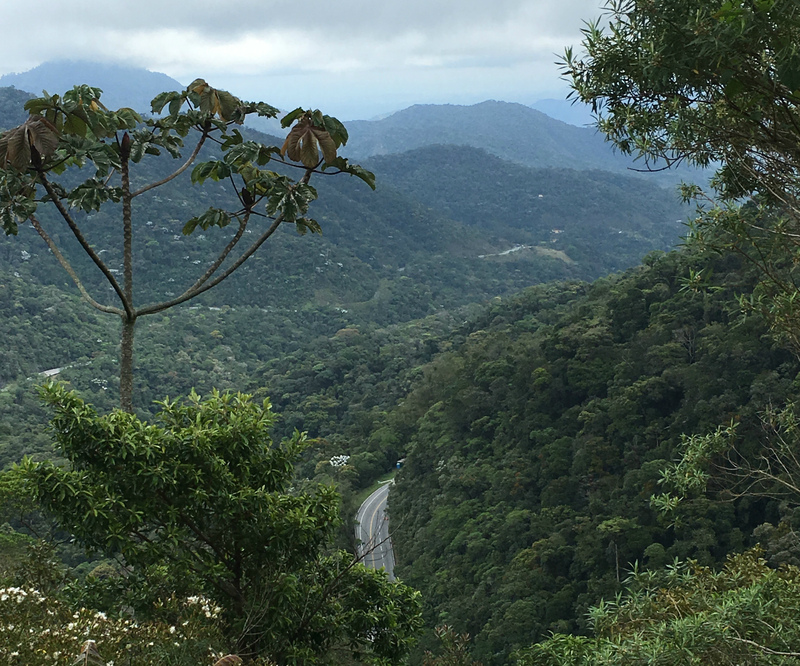 In spite of this challenge we did remarkably well with the many taxa endemic to the Atlantic forest that are possible here, and our results actually may have been helped by the overcast conditions we had during most days. 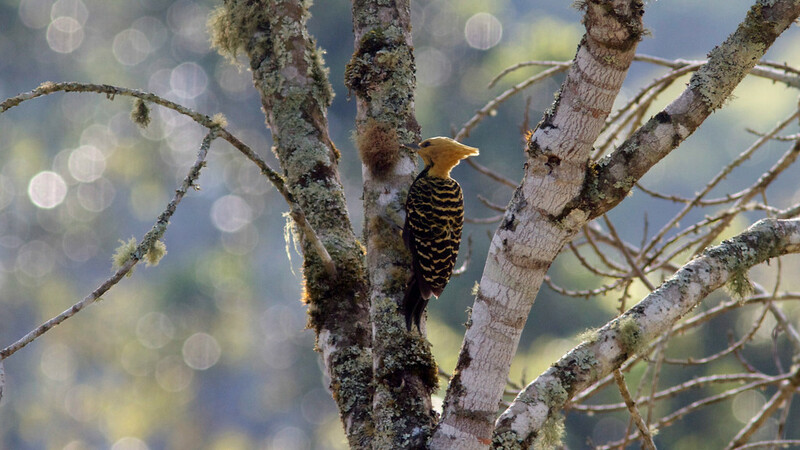 Itororo lodge is conveniently located near the town of Nova Friburgo, and although we stay very close to the town it really fells like we are hours away from civilization as the lodge is tucked into the mountains and the birding is fantastic right on the grounds. 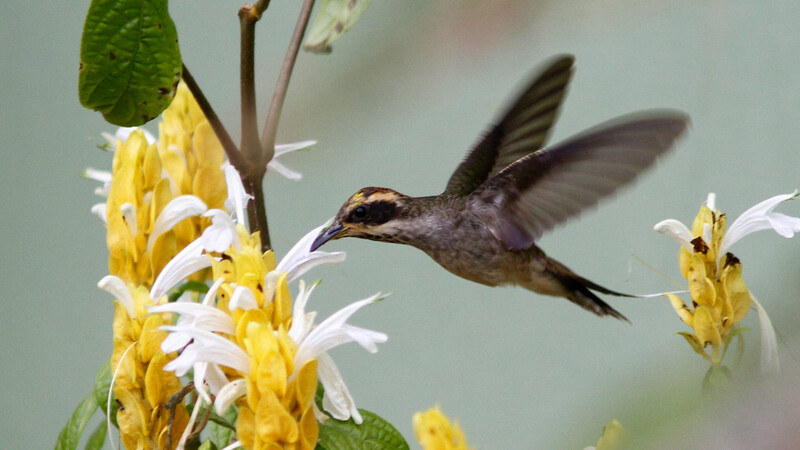 Several great species visit the feeders on a daily basis, among them Dusky-legged Guans, Saffron Toucanet, Green-headed Tanager, Scale-throated Hermit, and White-throated Hummingbird. The trail system from the lodge also produced memorable encounters with birds such as Half-collared Sparrow, Spot-winged Wood-Quail, Long-trained Nightjar, Variegated Antpitta and many others. The lodge is also conveniently located to visit a variety of habitats and different altitude gradients, and we were able to run several daytrips to different birding sites, where we picked up a number of high-elevation species such as Itatiaia Spinetail, Bay-chested Warbling-Finch, and Black-and-gold Cotinga. 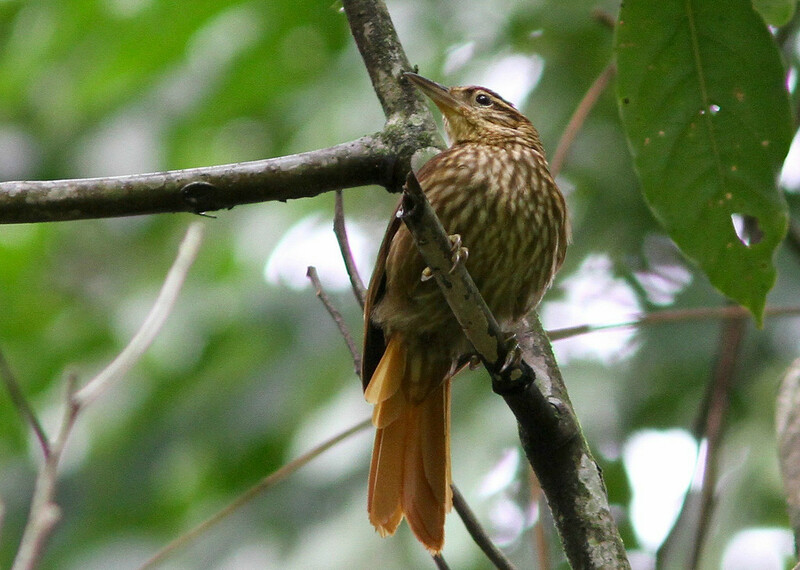 Additionally, a visit to the lowlands at REGUA resulted in fabulous views of Unicolored Antwren, Sungrebe, White-flanked Antwren, and Scaled Antbird. 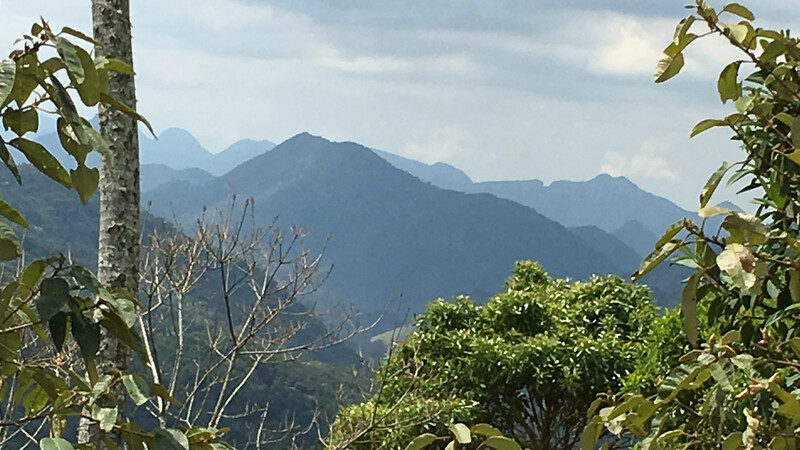 Other trails closer to the lodge made for some productive birding, too, with great looks at Slaty Bristlefront, Spot-billed Toucanet, Mantled Hawk, Serra do Mar Tyrant-Manakin, and a wide range flock birds seen a number of times. We also took a full day to venture a bit further inland and came back having seen Serra Antwren, Three-toed Jacamar, Blue-winged Macaw, and several other species that inhabit more open country. In spite of some challenging weather we came away with a lot of great birds, and I loved leading this tour and really look forward to doing it again next year! SOLITARY TINAMOU (Tinamus solitarius) – A rare look at one of these birds walking along the trail ahead of us on the CEDAE Trail. White-collared Foliage-gleaner, another Atlantic Forest endemic, often hangs upside down as it searches for insect prey in concealed spots. Photo by guide Marcelo Padua. SPOT-WINGED WOOD-QUAIL (Odontophorus capueira) – A highlight of the tour. We played some tape and one individual flew in from several yards away, flying right through our group and later walking towards us on the open trail ahead. One of those once in a lifetime experiences for the leaders. STRIATED HERON (Butorides striata) – A close relative of the Green Heron. CAPPED HERON (Pilherodius pileatus) – This colorful heron is usually found along rivers and we saw them on a couple of occasions on the tour. TURKEY VULTURE (Cathartes aura) – A little less abundant then the Black Vulture but seen almost every day on the tour. RUFOUS-THIGHED KITE (Harpagus diodon) – This is one of the more common raptors in the Atlantic forest so it was a bit surprising that we only saw it once but I guess the cold weather may have played a part in it. Scale-throated Hermit, one of the various specialty hummers we saw on the tour. Photo by guide Marcelo Padua. PLUMBEOUS KITE (Ictinia plumbea) – A regional migrant which we saw on the day we visited more open country. SAVANNA HAWK (Buteogallus meridionalis) – Another bird typical of open country habitat. We saw one in some pasture near duas Barras. WHITE-TAILED HAWK (Geranoaetus albicaudatus) – This species was placed until recently on the genus Buteo and after much discussion taxonomic work the boundaries of the genus have been revised. For those of you who may be interested in finding out more about this I recommend reading the proposals #282,377 & finally 460 which ended up placing this bird in the Geranoaetus genus which was previously a monotypic genus. MANTLED HAWK (Pseudastur polionotus) – A great spot by Jan allowed us to get some very nice looks at this scarce atlantic forest endemic. SLATY-BREASTED WOOD-RAIL (Aramides saracura) – An atlantic forest endemic that was seen or heard on most days. BLACKISH RAIL (Pardirallus nigricans) – Good views near in the marsh near the blue-winged macaw's nest. SOUTHERN LAPWING (Vanellus chilensis) – A common bird in city parks and open areas. The big Rusty-barred Owl was one of our nightbirding prizes. Photo by participant Ken Havard. GRAY-FRONTED DOVE (Leptotila rufaxilla) – Unlike the White-tipped this species is a forest bird and can be quite hard to see but we managed to find one on the grounds of our lodge. 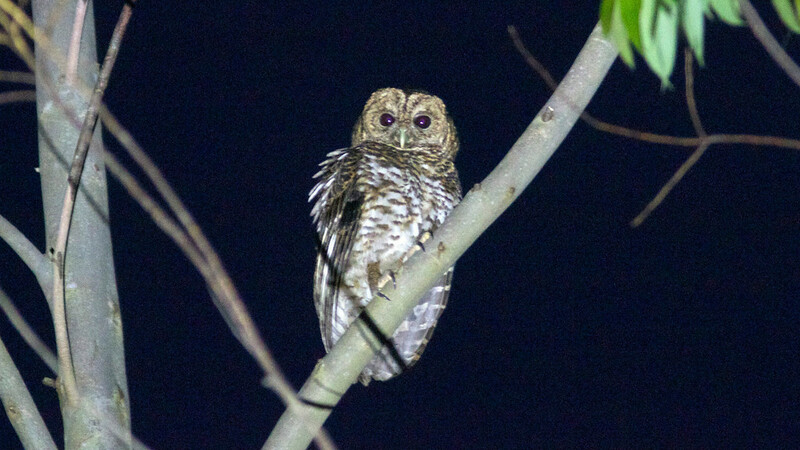 RUSTY-BARRED OWL (Strix hylophila) – We were waiting for the Long-trained Nightjar to show up when we heard it vocalizing and called it in for fantastic views a few minutes later. 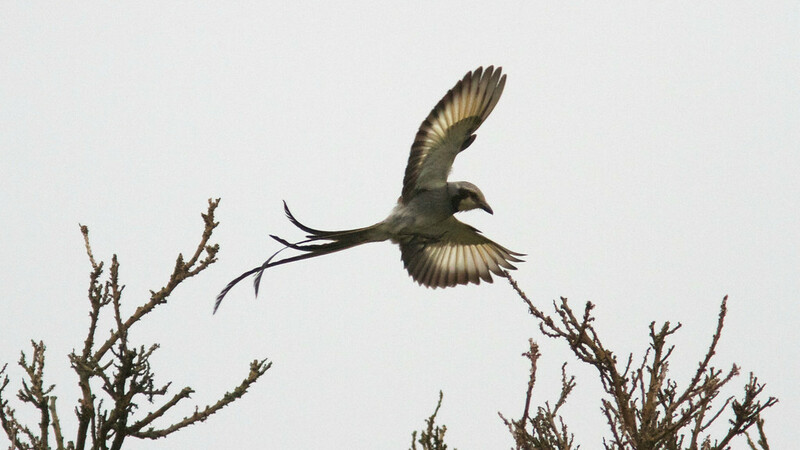 The beautiful Streamer-tailed Tyrant is among the open-country species we saw on one of our daytrips out from the lodge. Photo by participant Ken Havard. 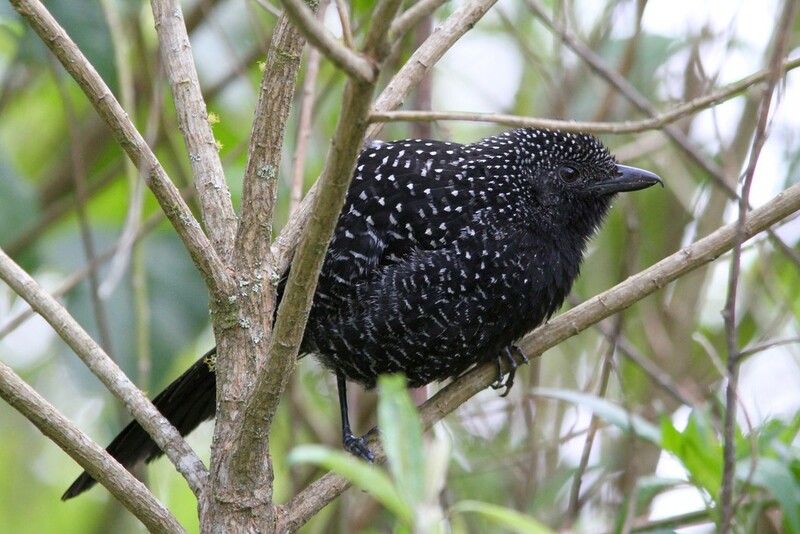 The star-flecked Large-tailed Antshrike is among several "big" antbird prizes possible on the tour. Photo by guide Marcelo Padua. SURUCUA TROGON (Trogon surrucura) – Seen excavating a nest on a termite colony right by the side of the road. THREE-TOED JACAMAR (Jacamaralcyon tridactyla) – After a long drive to see these unique Atlantic forest endemics we had just enough time to enjoy good looks at them before it started pouring rain. The Nova Friburgo valley, covered with lush woodlands rich with Atlantic Forest endemics. Photo by participant Ken Havard. 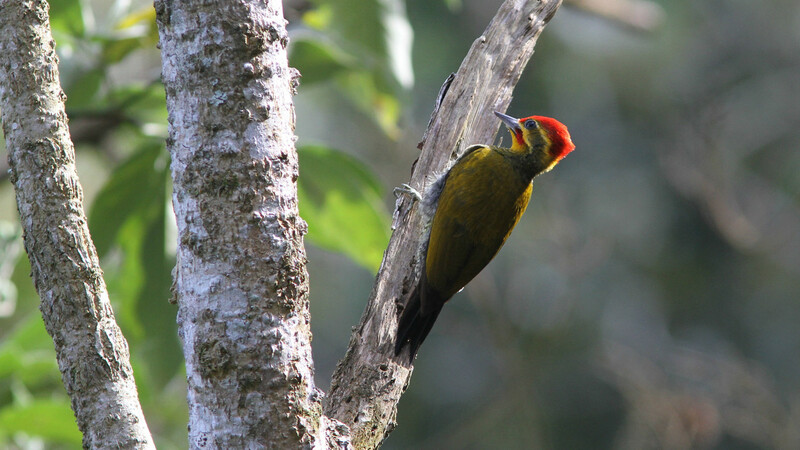 A handsome White-browed Woodpecker, photographed by guide Marcelo Padua. 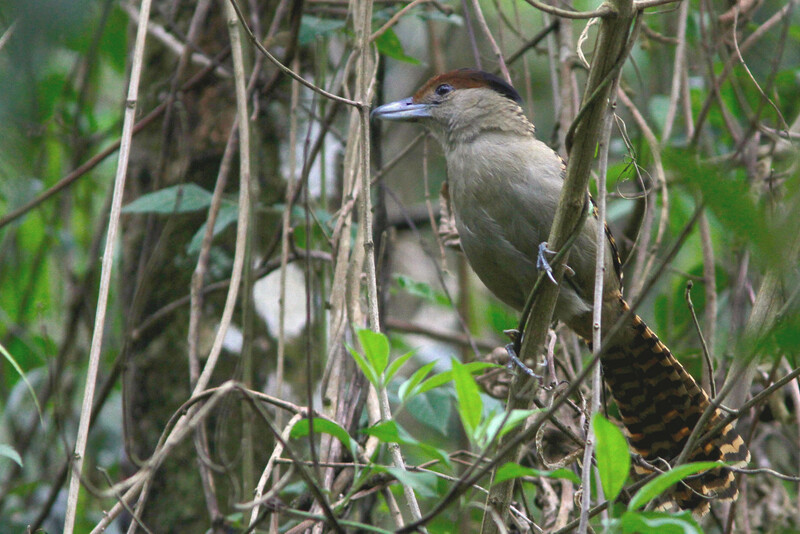 LARGE-TAILED ANTSHRIKE (Mackenziaena leachii) – Seen at Pico da Caledonia and later on right by the lodge. What a smart looking bird! White-bearded Antshrike is another "big" antbird endemic prize, one that typically hangs out high in the trees, thus this view. Photo by participant Ken Havard. STREAK-CAPPED ANTWREN (Terenura maculata) – This minute Antwren travels with canopy flocks and is often very hard to see. A view of the coastal mountains so typical of this part of Brazil. Photo by participant Ken Havard. RUFOUS GNATEATER (Conopophaga lineata) – This one made us work much more than usual for it and we worked on several individuals before getting a look at one which was strange as this species is usually quite responsive. 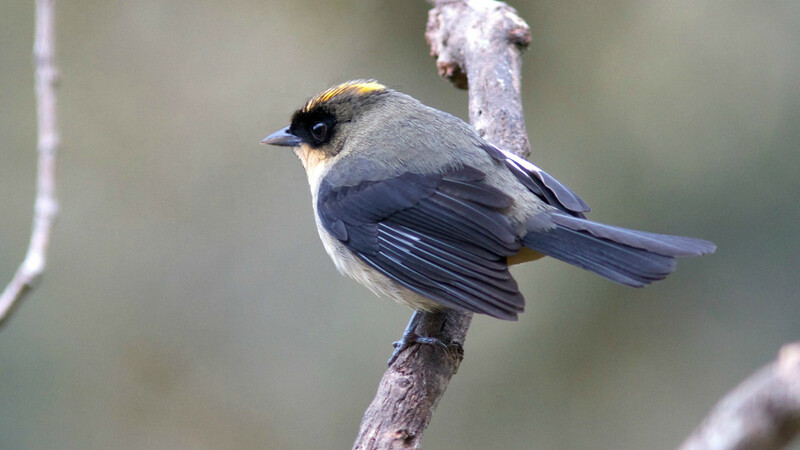 The birds in the area belong to the subspecies vulgaris. SPOTTED BAMBOOWREN (Psilorhamphus guttatus) – Another skulker that we saw extremely well during our tour. 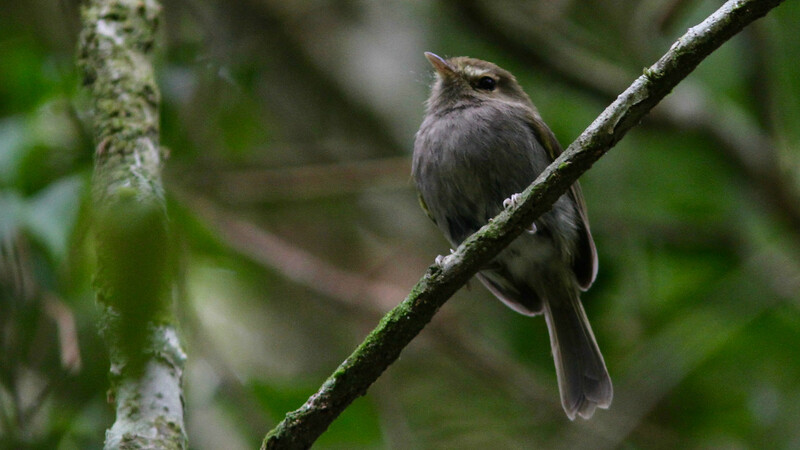 SLATY BRISTLEFRONT (Merulaxis ater) – Simply parading in the open for us. What a treat! MOUSE-COLORED TAPACULO (Scytalopus speluncae) – We did very well with Tapaculos on this tour having great looks at every single possible species. 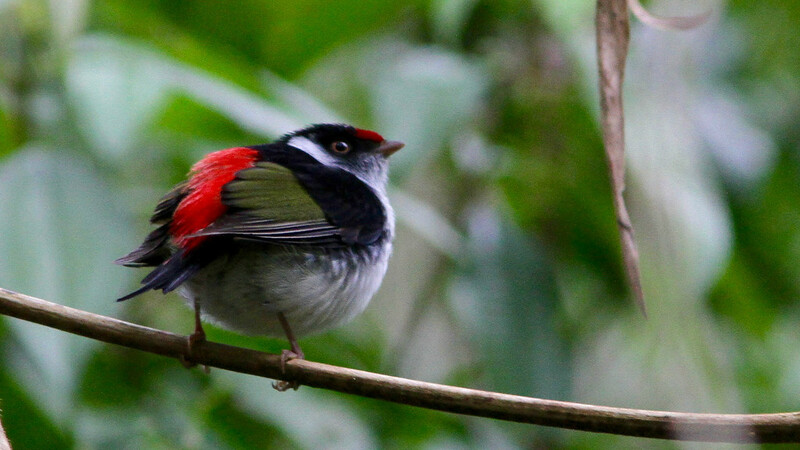 The lovely little Pin-tailed Manakin, photographed by guide Marcelo Padua. 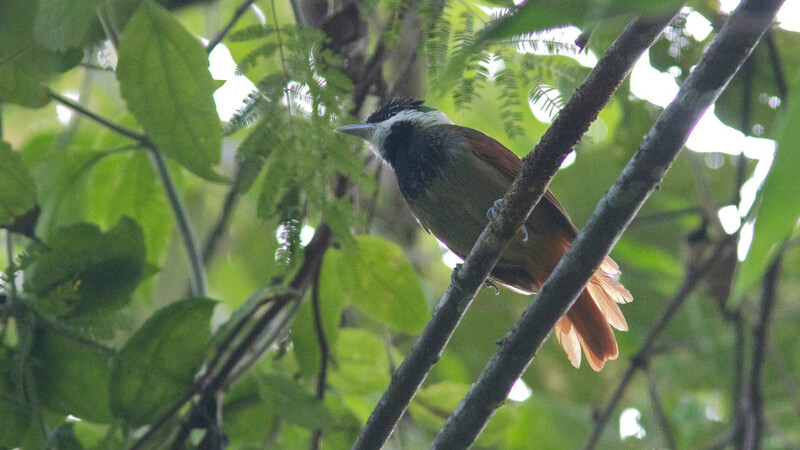 Pale-browed Treehunter, photographed by guide Marcelo Padua. GRAY-BELLIED SPINETAIL (Synallaxis cinerascens) – One of the hard ones to see as they are usually pretty shy. We had them on two occasions on the tour. 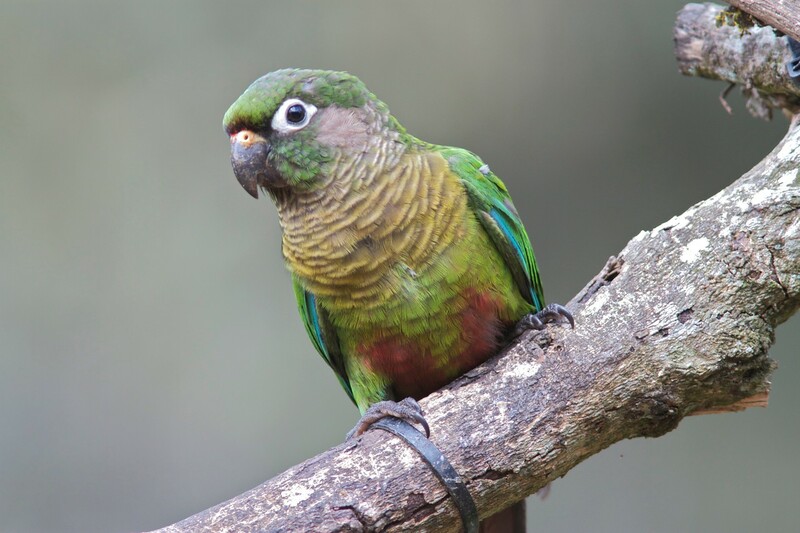 Maroon-bellied Parakeets are regularly heard screeching through the treetops in the Atlantic Forest here. Photo by participant Ken Havard. GRAY-HOODED FLYCATCHER (Mionectes rufiventris) – Oddly we only saw this species once, fortunately that is all it takes. 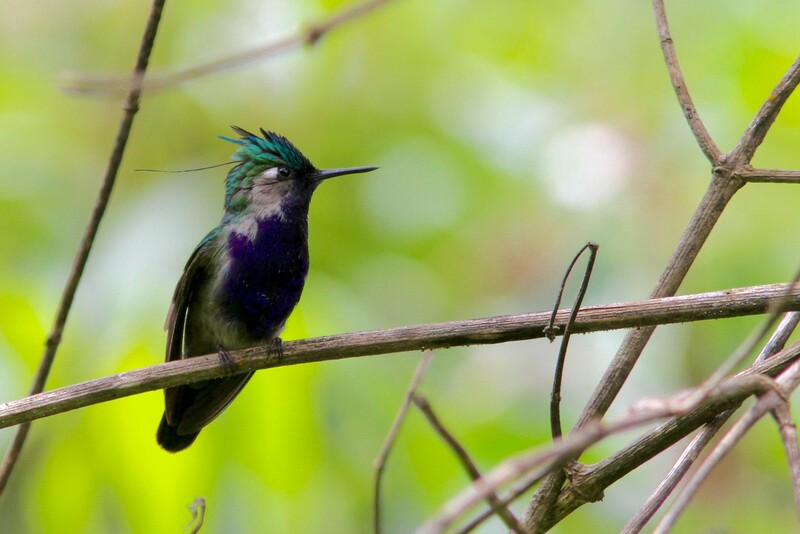 Green-crowned Plovercrest, another of the endemic hummers. This species gathers in leks where the tiny males give their simple calls incessantly. Photo by guide Marcelo Padua. 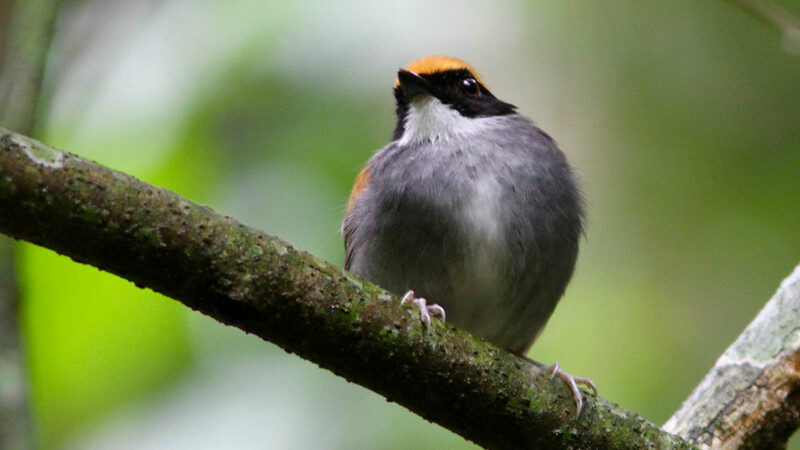 Gray-hooded Attila, photographed by guide Marcelo Padua. 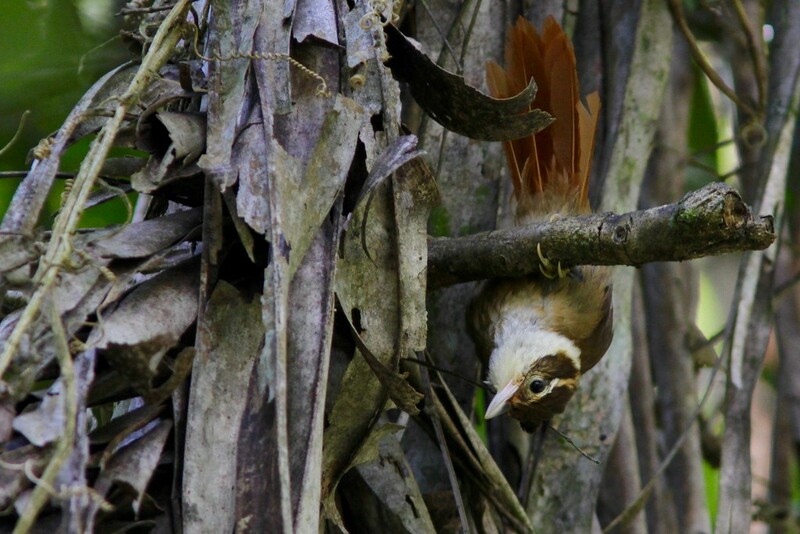 A female Giant Antshrike -- these birds are truly huge for a passerine, at about 12 inches long. Photo by guide Marcelo Padua. GRAY-EYED GREENLET (Hylophilus amaurocephalus) – This species was a bit of a surprise for me but we just made it far enough inland to get out of range of the Rufous-crowned Greenlet and into the range of this species. 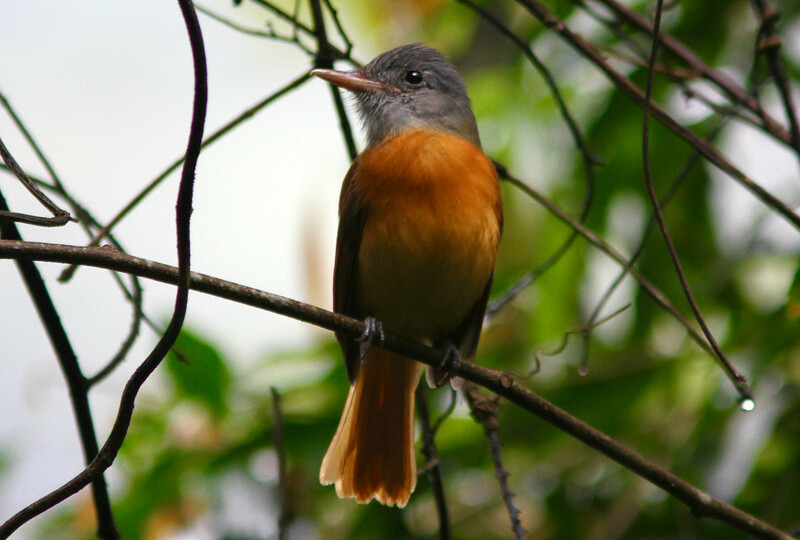 This bird has such a dismissive name that most of us want to see it just for that reason: Drab-breasted Pygmy-Tyrant! Photo by guide Marcelo Padua. The lovely Blond-crested Woodpecker can be inconspicuous. Photo by participant Ken Havard. Black-goggled Tanager is found in the Atlantic Forest understory. Photo by participant Ken Havard. 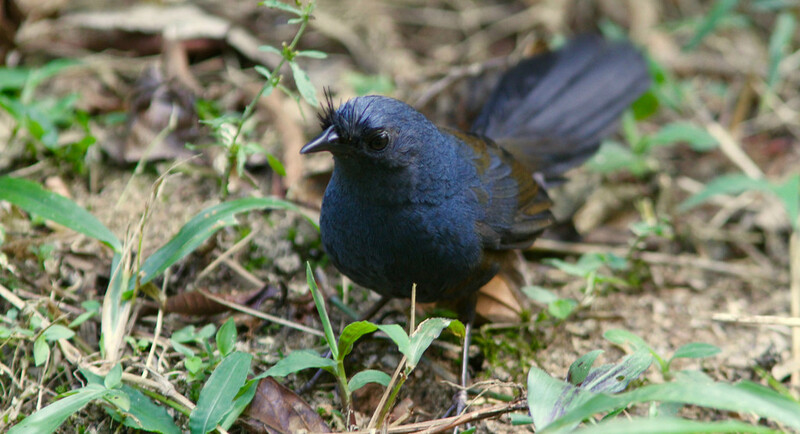 We close our images from this tour with this Black-cheeked Gnateater, a ping-pong ball of a bird that can easily go undetected except by its occasional harsh call or long trilled song in the understory. But it's a lovely visual when we spot it. Photo by guide Marcelo Padua. BROWN-THROATED THREE-TOED SLOTH (Bradypus variegatus) – A great spot by Andy resulted in some nice scope views of one.